James Beard Award-winning chef Galen Zamarra on some major fish mistakes you may be making. First, the bad news: You’re probably overcooking your fish. James Beard Award-winning chef Galen Zamarra, of Mas (Farmhouse) and North Fork’s soon-to-open The Halyard at Sound View, says that overcooking—which causes that white, protein-y ooze to emerge from the filet—is the most common fish-cooking mistake. The good news? There’s an easy way to avoid this, and you can use an item sitting on your desk right now. Of course, there are several ways to mess up fish—even before you get it on the pan. Zamarra shares a few tips for feeling more empowered at the fishmonger, which can be intimidating, especially with all those glistening fish looking at you. 1. Opt for whole fish. You can ask your fishmonger to filet it for you. If cooking a whole, scales-and-everything fish feels intimidating, ask your fishmonger to prep it and filet it for you. That way you can get the benefits of whole fish—freshness—while cooking it in a way you’re comfortable with. 2. Make eye contact with the fish before buying it. Seriously. “If you’re buying a whole fish, always look at its eyes,” says Zamarra. “They should not be white or glossy. They should be nice and bright.” Peek at the gills, too—they should be bright red. 3. Ask if the fish or shellfish has ever been frozen. Often vendors will sell shrimp or squid, for example, that were frozen and thawed before hitting the market, and you wouldn’t be able to tell just by looking at them. The process of freezing has a massive impact on the product’s flavor and texture. 4. Eat more wild striped bass. 5. Make sure your mollusks are alive. Never cook clams or mussels that are dead, as dead shellfish spoil quickly and become inedible. Fortunately, there’s an easy way to check before buying. 6. 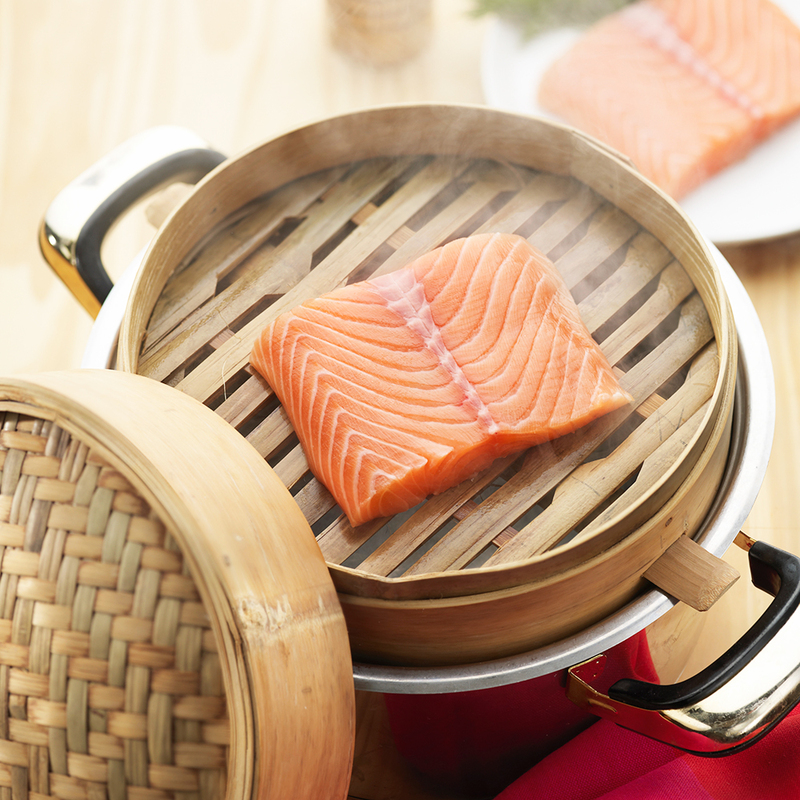 Be wary of misleading marketing—especially when it comes to salmon.